When investors estimate the volatility of an investment, they often do so using daily, weekly, or monthly returns. However, when we want analyze the risk-adjusted performance of an investment, we tend to use measures of volatiσlity that expressed in annual terms. For example, when we compare the Sharpe ratio between different investments, there are almost always expressed in annual terms. Therefore, we need to come up with a measure of annual volatility. Hence, we need to annualize volatility. where T is the full time period for which want the standard deviation (e.g. 1 year), t is a single period (e.g. 1 month), σt is the standard deviation over a single time period. In that case σT is the T-period volatility. For example, if σt is a monthly measure of volatility, than multiplying the value with the square root of 12 will give you the annualized volatility. 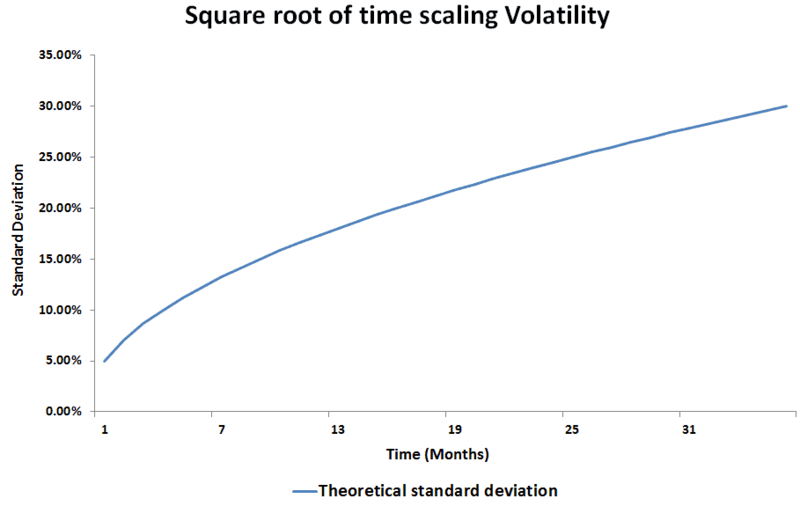 While the standard deviation scales with the square root of time, this is not the case for the variance. To see this, let’s calculate the T-period variance. To do this, we take the power 2 of the left-hand side and the right-hand side. Thus, the variance scales linearly with time! Now, let’s illustrate the above concepts using a simple numerical example of volatility scaling. The annualized volatility equals 17.32%. The following figure illustrates how the standard deviation evolves with time. We can clearly see that the relationship is not linear. Annualizing volatility is an important consideration in a number of financial applications. For example, it matters when calculating value-at-risk or risk-adjusted performance measures (e.g. Sharpe ratio).